Our Strong and Healthy Hands Kit is made to order for building and maintaining hand health and providing relief from arthritis, RSI, carpal tunnel syndrome, tennis/golf elbow, joint pain, and other lower-arm ailments. 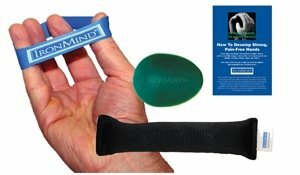 Our Three Tools Kit includes one IronMind 1-Minute (softer) Green EGG, one set of IronMind Expand-Your-Hand Bands, the Wrist-Relief Soft Weight, and the booklet "How To Develop Strong, Pain-Free Hands" by Randall J. Strossen, PhD: three vital training tools and one training guide for preventing, reducing, or eliminating hand, wrist, and elbow pain. The IronMind EGG strengthens and massages your hand and fingers as you squeeze--you decide how hard--working your joints and tendons and building your grip. It feels so good! The Expand-Your-Hand Bands build muscle balance and range of motion as you flex your fingers outward against the resistance of the bands--and say goodbye to tendonitis, elbow pain, and stiffness in your hands. Gently rotate and stretch your wrists with the Wrist-Relief Soft Weight to relieve the wrist-related discomfort associated with carpal tunnel syndrome, arthritis, and RSI; improve blood flow; and increase flexibility.